Beyond my recent article titled “The Greatest Irony: Africa’s Best Mayor’s City Flooded Again | Killing Over 150 People”, the fact that the Accra Metropolitan Chief Executive, Alfred Oko Vanderpuije (Mayor of Accra) is still in position after last week’s flood which killed over 200 people and that of the previous years is a strong confirmation that we are addicted to incompetence. Interestingly, I was recently a member of a JOY FM’s Ghana-Connect discussion panel which looked at the hovering incompetence in Ghana and the non-existent culture of resignation—the Mayor of Accra-Alfred Oko Vanderpuije being in office today is an indication of how deep this problem goes within our public offices. In my submission during the discussion, I said that “by default no one would resign even if that person is grossly incompetent but in other societies, people resign because of either a hovering tendency of being FIRED or excessive pressure from the masses. This brings me to my question; why is Alfred Oko Vanderpuije still the Mayor of a city that floods each year under his leadership? The answer is simple, no one will fire him despite the gross incompetence and the masses are unable to mount enough pressure on him to resign—because, we cannot separate national crisis such as floods even when we are dying from politics. In China, only 37 people were killed by the 2012 Beijing flood and yet, Beijing’s mayor-Guo Jinlong and his deputy-Ji Lin resigned. Meanwhile, over 200 Ghanaians died last week with several others having died from previous years’ floods—and our mayor remains in office, as though he is Kim Jong Un of North Korea. Don’t tell me the lives of 37 Chinese in Beijing are worth more than the lives of over 200 Ghanaians in Accra. READ ALSO: The Proliferation of Junk Food Restaurants in Ghana | Another KFC Opens in Kumasi…Should We Not Be Worried? Even if the people of Ghana are not smart enough to request that Alfred Oko Vanderpuije steps down, does he not have the individual conscience to realize that he has totally failed the people and as such, he has to descend from that throne he cherishes so much? Then again, why should he resign? It’s a cool job. Just do nothing and be paid hugely each month—beyond that, drive around Accra with enviable entourage any time you want and be adulated for doing nothing. If you get bored of Accra, use the tax payers’ money to fly to Angola and be awarded as the ‘Best Mayor in Africa’ for doing nothing—and on your return, have a giant billboard mounted with your photo to welcome you back. Pretty an easy job which you wouldn’t even find in a video game yet in Accra, this is a reality—one man’s position is far worthy than the heaping annual death count. Sometimes people do not have to even die—in the UK, several mayors have resigned for various reasons; such as making unacceptable comments and vouching for the wrong person. Yet in Ghana, several people are being killed each year under the watch of the so called ‘Best Mayor of Africa’ and he still smiles at the cameras as the man in charge, unquestioned and unmoved. Until we begin to hold those in charge of our cities and country responsible for their individual or collective incompetence, they wouldn’t pull their weights and we will continue to sink down the gutters—if we are lucky, only over 200 will die. 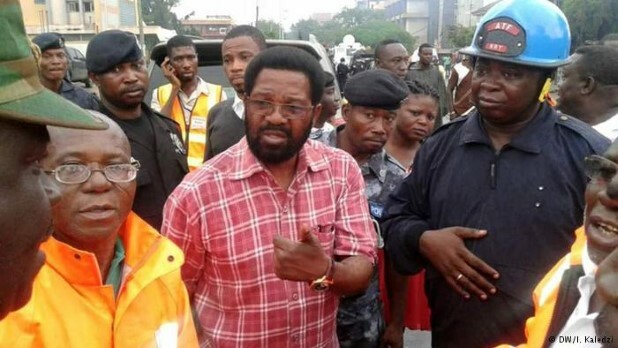 The on-going discussions following the Accra flood disaster have been interesting but no one is looking to indict the man who is in charge, the man who was/is tasked with the oversight responsibilities. He’s beyond criticisms and no one can call for his head to be put on the chopping board, Game of Thrones’ style—because of political reasons. He won’t. He’s a Ghanian with a sense of entitlement. When did you last see Ghanaian accept responsibility for anything? It is either the government’s faulty or the devil’s doing. Nothing is ever the individual’s fault. The devil and the entity called the government has been shitting and dumping refuse in the gutters of Accra for years. No Ghanaian ever did anything wrong so why should they resign? Hmmm nice article and I just can’t agree agree more with Manasseh,the ostrich attitude in play.Africa lacks such accountability except recently I heard one African country did likewise. Mannaseh i just can’t agree more with you my friend. Typical ghananian mindset every misfortune is either the govt or the devil. Past and present accra mayors have tried and failed all attempts to clean up and decongest the city (taking hawkers off the street). The same ghanaians called these mayors all sorts of names. Now per our own disregard for the law and the dangers of littering our gutters we turn around and blame the mayor and the govt as if they caused the flood. Yes it is true our leaders have failed us in so many ways but we as citizens have a role to play in the development of the country and one way we can do that is by been law abiding. “Nobody can blame me! My good works are there for all to see. Only recently, the whole of Africa recognised this and gave me an award. No downpour, no deluge, no Noah’s flood, I repeat, no rainwater can wash away my achievements and my glory,”. Then he goes on about going to erect billboards to announce his intransigence. What ever happened to decency? A decent person will resign because of the tragedy. Even if the fault is not directly yours, you resign to show respect for those who lost their lives on your watch. After all you are the mayor and by extension the guardian of all the citizens in the city. It is your responsibility to protect them. You failed to do so. So as an act of decency you resign. That is what decent people do. O wait this is a Ga man. Decency is not in their vocabulary. He’s also a self-entitled Ghana man. Who believes his position is sanction by god and his tribe and therefore is not answerable to anyone. Only in Africa will this tin-pot kim jong un continue to mouth off. In any civilized country, he’ll be facing a board of inquiry or worse jail time. Welcome to Ghana. Where nothing works and the laws don’t mean squat.